The government was wrong to cancel an £80m loan to Sheffield Forgemasters to make parts for nuclear power stations, Labour leader Ed Miliband has said. His comments came as he visited the plant after Business Secretary Vince Cable said the loan was unaffordable. Mr Cable told MPs on Thursday that the coalition inherited a "very difficult" financial position. 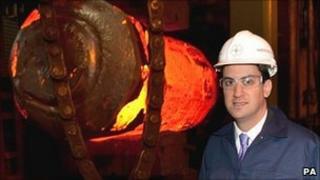 But Mr Miliband, visiting the Forgemasters factory on Friday, said the loan should have remained in place. He said: "I think they made the wrong decision, absolutely. It was a loan, it was a loan that would have been paid back. "They have made the decision and I hope they continue to think about how they can help in the future from the funds available. "I hope they can get the kind of investment they need. It is a fantastic British company and I was incredibly impressed by what I saw there today." On Thursday, the Business Select Committee's chairman Adrian Bailey (Labour, West Bromwich West) said there was "bafflement" among MPs on the committee over the coalition's decision. The committee heard that of the 241 projects reassessed by the government, 217 were going ahead, 12 were postponed and just 12 had been cancelled. The cuts would save between £1bn and £2bn, it was told. Mr Cable had previously agreed that the loan to Forgemasters was good value for money. But he stressed on Thursday that the scale of the cuts the government needed to make was because of the state of the economy it inherited. He said: "It would have been straight cash out of the door in the financial year."